You spend enough time at these bars that it's pretty much a given -- from time to time, you're gonna find yourself 1) in a strange NYC neighborhood in the AM, and 2) in need of a cup of coffee. Or five. 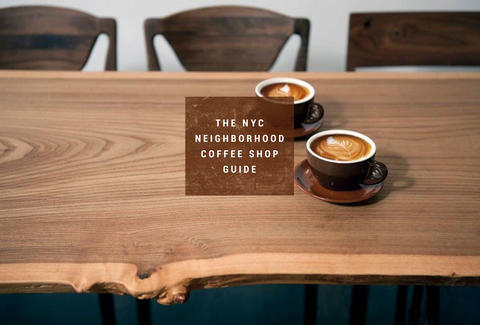 For all those times... to times, rather than scrabbling at the empty bodega urn, pull up this guide: a roster of the best coffee shop in 30 NYC neighborhoods. There was a sad, decaffeinated time before NYC was flooded with serious, for-real, great espresso and coffee shops, and it was right then that Ninth Street Espresso arrived, changing the landscape of this sleepy, weeping willow corner at 9th St and Avenue C forever. Though the no-BS coffee chain has several spots now, this guy remains the best. 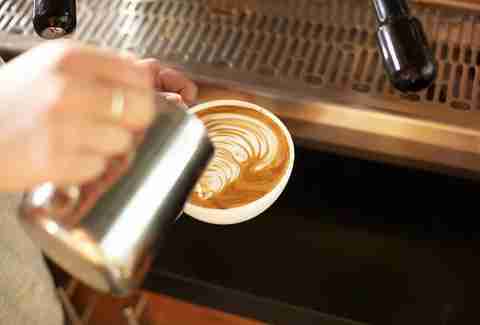 Perhaps only in Queens might someone pair craft coffee with... grilled cheese!... but there you have it at The Queens Kickshaw. The spacious, wood-filled room is a calm break from the bustle of crowded Broadway around the corner, and is open from espresso o'clock ’til beer time, closing at midnight with excellent grilled cheeses (and one of the best mac and cheese dishes in the city) all along the way. It's not every cafe that can make a small space feel both airy and cozy, but the comfortable, slightly-antiqued Daily Press in Bed-Stuy gets as close as any. Solid coffees from Hudson Valley roaster Irving Farm are joined by bagels, historic neighborhood photos, and a great patio. This tucked-away outlet of the growing Bay Area coffee roaster's empire is one of its best New York iterations: the tiny shop is nearly all window-walled, and when the windows open and the cafe spills into the street... there’s, you know, just a nice energy here -- sorry, is that too West Coast? Though the bustling, epic-people-watching Variety Coffee on Graham Ave may be better known, this newcomer to the family is a stunner. A sunny corner of Wyckoff is made brighter by this local cafe's spacious footprint, which, by the way, is now where they roast their own coffee. 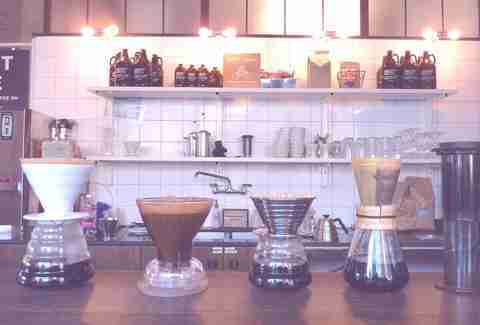 Though its street-level-condo exterior may lead you to presume otherwise, Pushcart is home to both democratic (the main counter) and uber-geeky (the manual bar around the side) coffee. 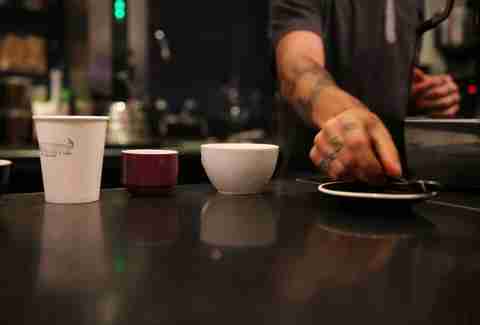 It also features local and out-of-town guest coffees from artisan roasters (and a tiny table!). This archetypical example of a New York City coffee shop (sorry Central Perk) is a standing room-only shop whose warm lighting and necessarily intimate, locally beloved feel can provide a sense of belonging in a city that doesn't always. Bonus: they open up their front windows to the street on warmer days. Set in the repurposed revolving door of an office building, this Aussie-run cafe has two separate sides -- the public compartment, and the compartment for those who work in the office building. Each side is entitled to excellent flat whites and lamingtons. 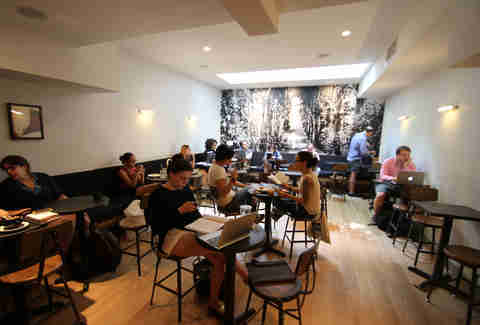 A local coffee chain that feels more mainstream than it is, Gregorys' unique take on coffee bars has spread throughout Manhattan. Some tend more towards the nerdy than others, but all feature a cast of interesting, quality roasters (including this location). 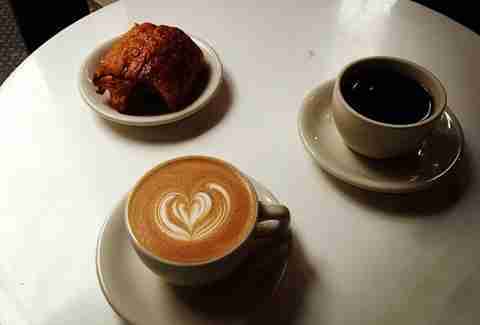 Why did it take so long for someone to serve great coffee to Fort Greene? 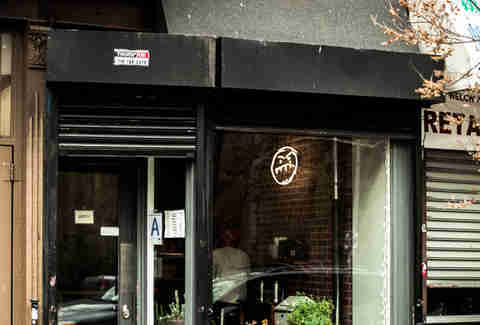 Hungry Ghost's second full cafe -- the first is in Prospect Heights -- is a pioneer in Fort Greene. 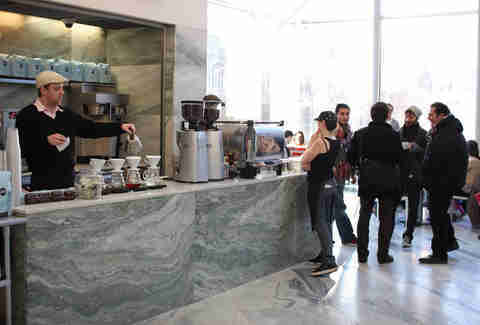 Stylish and slightly austere decor fills this corner of Fulton St, while Stumptown-fueled drinks flow from the bar. 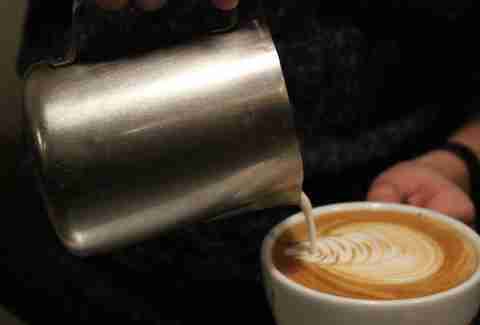 If there's one thing the advent of high-end coffee has brought to the city, it's an increased dearth of truly cozy coffee spaces -- all those serious espresso bars tend to hustle you along. Not so for Propellor, whose sunny mish-mash of Danish modern furnishings and tasty coffees inspire lazy mornings (and afternoons). 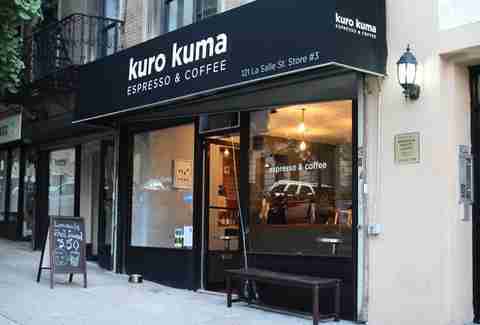 A charmer serving coffees from Durham, NC roaster Counter Culture, Kuro Kuma is a small, kinda, sorta awkward little space in a part of town that's dying for more great coffee. A good destination for caffeine (and Wi-Fi) under the 1 train. 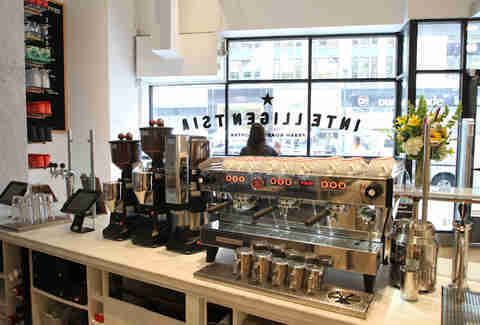 Recently opened in a giant flagship Urban Outfitters, this sleek, highly efficient outlet of Chicago/LA coffee heavy-hitter Intelligentsia features upscale coffees, pastries, and teas (and a great vantage point for taking pics of the Empire State Building with your iPad, or something). 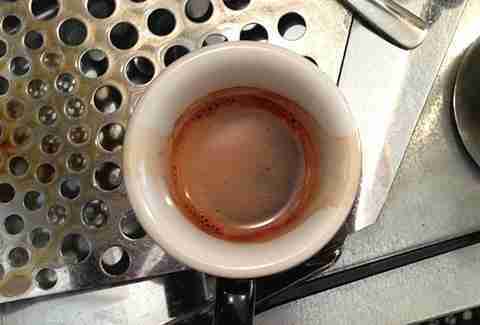 For those who need great coffee way the eff Uptown, Darling Coffee's a lifesaver. This gentle giant near the top of the A train has been bringing coffee to the tip-top of Manhattan since 2012, and now serves beans exclusively from Plowshares, an artisan roaster from Hillburn, NY, just a stone’s throw (okay, a really well-thrown stone) from the Northernmost reaches of NYC. Bonus: house-made pickles! 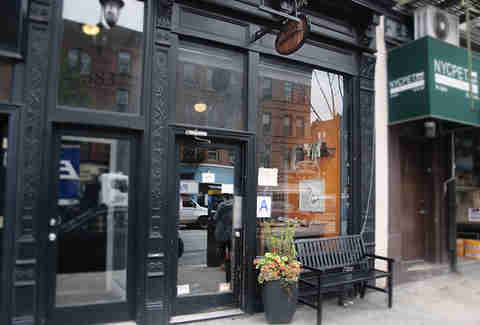 This LIC cafe's known for two seemingly contradictory traits: meticulous attention to detail and a chill environment. 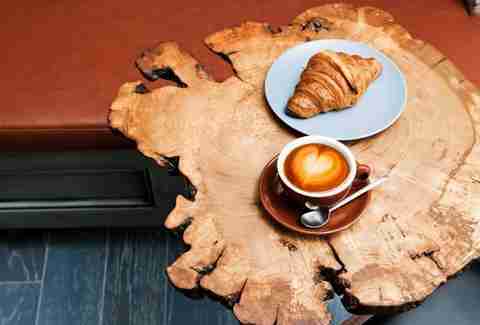 Hunker down in a big chair (or at an old factory work table) for a carefully brewed coffee from their own roasting works and a house-baked pastry, which you can inspect while it’s made by peering through a picture window. With their in-house bakery just next door, this quiet branch of the Brooklyn-based roaster also occasionally plays host to coffee-brewing classes, in case you wanna step up your at-home game. Innovative coffee and cozy service on 38th St? Yup, at Culture, where the unexpected surprises run deep (do NOT sleep on the fresh-baked cookies). 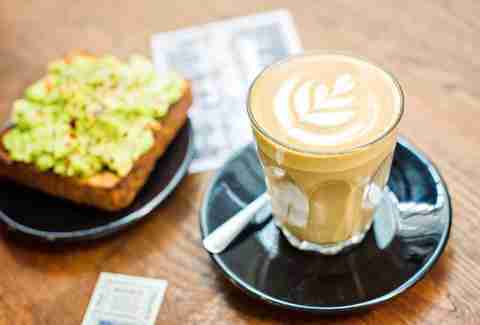 Part of the contemporary wave of Australian-run/inspired cafes, Little Collins focuses on service as much as exceptional espresso and brew coffee. They've got fancy under-counter coffee brewing modules known as Modbar, and although there’s almost nowhere to sit, the coffee and house-made schnitzel (??) make it not matter. Perhaps the busiest Joe location, this sunny, marble-ensconced atrium is constantly filled with both coffee-breakers and study-breakers -- you get to choose which kind of person you'll share a table with, because you will definitely be sharing. Also, their sandwiches are pretty legit. Their upstate ways (the coffee's roasted in spacious Ithaca) translate surprisingly well to the city crowd. This standing-room-only bar serves up nice espresso drinks and stylishly packaged beans and coffcessories. Dude, don't blink!!!! 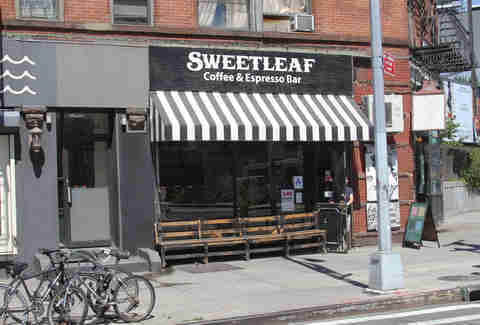 'Cause if you do, you might walk past this inconspicuous 7th Ave cafe and miss some of the best coffees in the neighborhood being made for you by some of the city's best baristas. 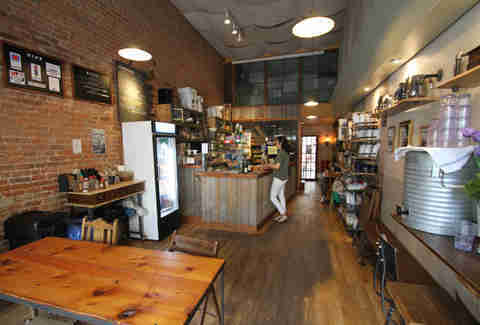 A long, narrow space, the Park Slope Grumpy isn't ideal for a long dawdle -- laptops aren't allowed -- but chatting up your barista at a seat at the back bar while you sip your by-the-cup brew is totally permitted. Though you can actually find an abundance of cozy places to sit and drink terrible coffee, it's rarer and rarer to find cozy places to sit and drink really good coffee. Sit & Wonder remains one of them -- an unpretentious (and not college-y) hangout cafe on a rapidly changing strip of Washington Ave. There’s a patio, as well as (bonus alert!) a guy that sometimes comes in and hands out random things he's found on the street. 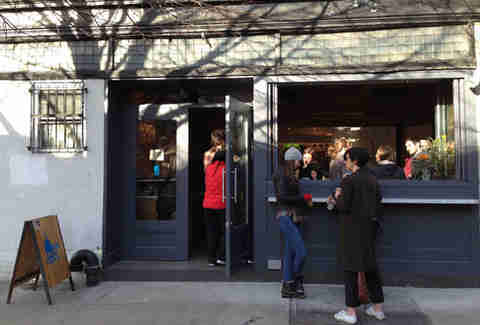 While Fort Defiance is a full-fledged (and very fine) restaurant, its daytime hours are the shared domain of the coffee drinker and breakfast cocktail crowd. Counter Culture beans provide the caffeine at this New Orleans-influenced joint, and there's no better place in Red Hook to enjoy a relaxing (mid-)morning coffee. Staking out their space on a competitive corner of Canal St, this surprising, wedge-shaped gem of a coffee bar has a Danish-y, '50s-modern-influenced decor, plus Counter Culture coffees, handcrafted sodas, and just a little bit of attitude. 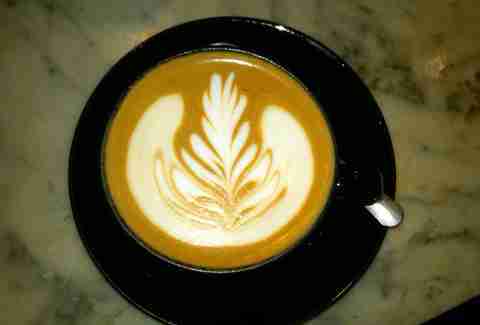 A neighborhood cafe on deep 6th Ave, Southside caters to aging hipsters, junior high students, yoga moms (!!! 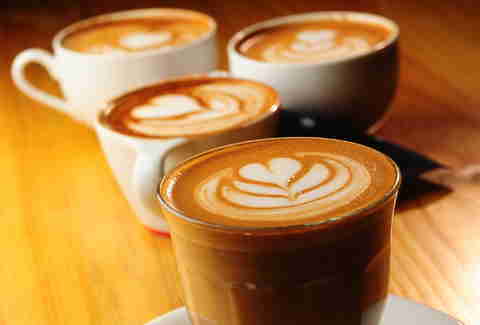 ), dog people, and everyone in between with equal warmth and superior, awesome coffee from a variety of roasters. 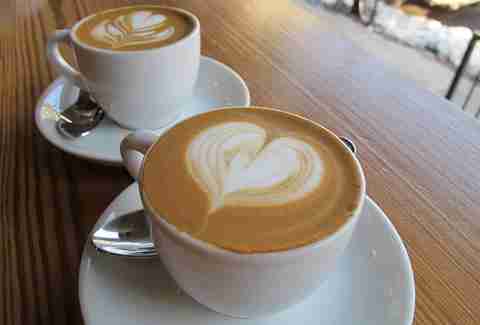 Make sure to confirm which Kaffe 1668 you're meeting your friends at -- there are two just a few blocks apart on Greenwich St. This, the original location near Chambers, is notable for its two levels of seating and abundance of wooly sheep (not real). 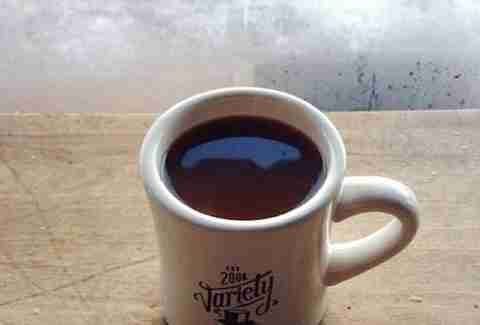 Owned by Scandinavians, they roast their own coffee out in Red Hook. Though the neighborhood surrounding it is a coffee desert, this Lexington Ave outpost of local mini-chain Joe is the UES's most picturesque oasis. 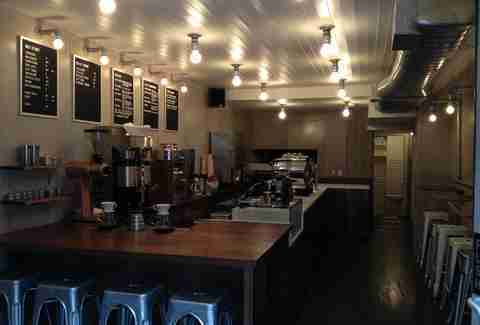 It's also one of the roaster's most beautiful shops -- sit and space out by staring at the light fixtures until the caffeine kicks in. Though it's only been there a little more than two years, it's hard to imagine this stretch of the UWS near W 79th St without the spacious, bustling caffeine-ery. 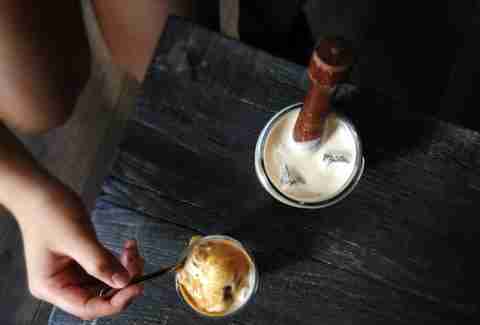 Irving Farm serves upstate-roasted coffee and stalwart food like grilled cheeses with ham or a Cubano with homemade pimento cheese. It's also great for people (or puppy) watching. 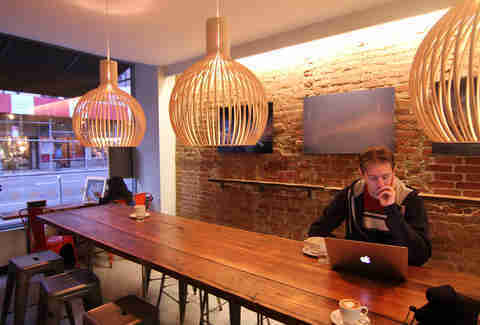 Grab a fancy haircut and a fancy coffee -- locally roasted just a couple miles away near the Navy Yard -- at THE SAME TIME in this chic Williamsburg establishment with super well-executed coffees. 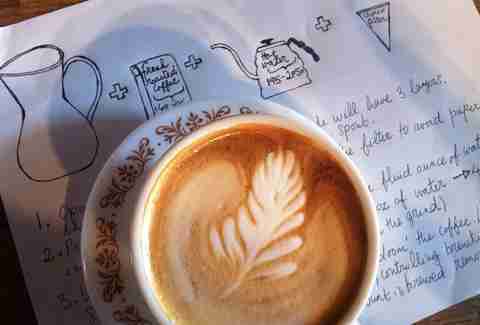 Liz Clayton is a coffee writer and photographer living in Brooklyn, New York. She's the Associate Editor of coffee website sprudge.com, and a regular contributor at Sprudge, Kinfolk Magazine, The New York Observer, and others. Her book Nice Coffee Time was released on Presspop in 2013.